This Instant Pot Rice Pilaf comes together in a snap with just a few pantry staples. The perfect simple and quick weeknight side dish. I still have a healthy obsession with my Instant Pot and I hope you do too. Gauging by the most popular recipes on the blog last year, I think it’s safe to say that you do. I always seem to make main dishes when I break out my Instant Pot so I wanted to mix it up a bit with a simple side dish and this Instant Pot Rice Pilaf couldn’t get easier. This little combination yields some delicious flavor that goes with just about any main dish. This homemade version tastes so much better than the boxed stuff and only takes a few extra minutes of effort. Chopping and sauteing the onion and garlic adds a few minutes of prep work before it cooks away in the Instant Pot. The rice and orzo pasta also get a little saute in the butter along with the onion and garlic to give them a little toast. This adds some nuttiness to the dish. It’s a simple little step but it really does enhance the richness so don’t skip out on it. The rice cooks up to its normal chewy texture and the orzo pasta softens so it’s a really nice play on texture. I served this alongside a simple and tasty chicken dish that I’ll be sharing later this month. If you’re looking for inspiration now, I think this BBQ Avocado Melt situation would be fantastic with it or a classic, simple chicken cordon bleu. 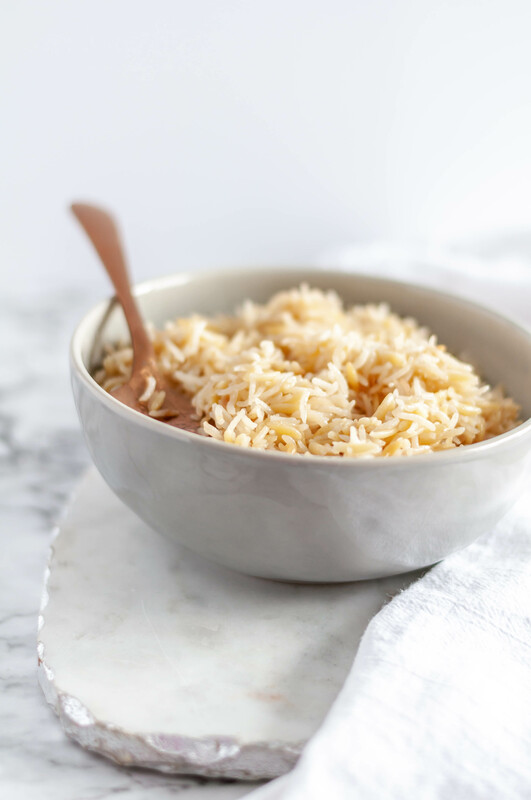 Keep this Instant Pot Rice Pilaf in your back pocket for a quick, simple and delicious side dish to any meal. Simple ingredients and preparation. Turn Instant Pot to saute mode. Once hot, add butter, onion, garlic, rice and orzo. Cook for 2 minutes, stirring often, until rice and orzo are toasted. Turn off saute mode. Add chicken stock and salt. Close lid and seal valve. Set Instant Pot to cook for 4 minutes on high manual mode. Allow to naturally release for 5 minutes then quick release the remaining pressure. Stir and serve.